Riesling is a very hardy grape variety that thrives in cool climates and relatively poor soils. The grape requires a long growing season to ripen properly. In warmer climates, Riesling can lose its acid backbone, which is a main characteristic that helps make the wine bright, complex and balanced. Riesling wines generally do not respond well to newish, small oak barrels, preferring to be vinified and aged in stainless steel or larger neutral wood containers. Riesling is a very aromatic and expressive grape variety, offering impressions of fresh flowers like honeysuckle and jasmine. Riesling’s aromas and flavors are often compared to orchard fruits like apple, peach, apricot (the apricot aroma is often a characteristic of the wonderful “noble rot”) and even the tropical-scented lychee or guava. Riesling wines are often described as tasting clean, racy and bright. Aged Riesling can take on more complex aromas which, in high quality wines, can include an aromatic expression of petrol, diesel or linalool. Riesling’s compact bunches and small berries make it prone to rot (some of which is beneficial and necessary to make certain styles of wine). 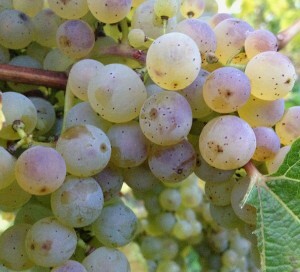 Noble rot (Botrytis cinerea) dehydrates ripe grapes, concentrating them to a point where they are capable of producing very memorable, rich, long-lived dessert wines.